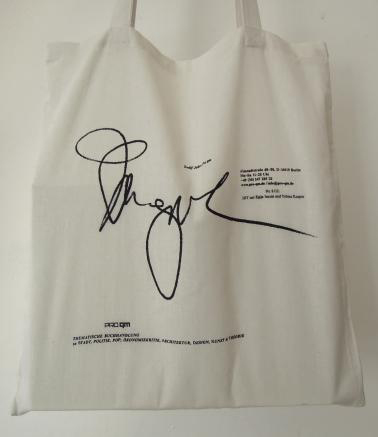 We have been invited to contribute to a canvas bag design on the occasion of the book shop’s 12th anniversary. The design has been conceived in collaboration with Egija Inzule and Tobias Kaspar. Amongst the twelfth contributors: Abäke, Bernadette Corporation, Laurenz Brunner, Gui Bonsiepe und Matthias Görlich, Zak Kyes, Metahaven, Dexter Sinister, Judith Hopf, Project Projects, Manuel Raeder und Bless, Vier5.